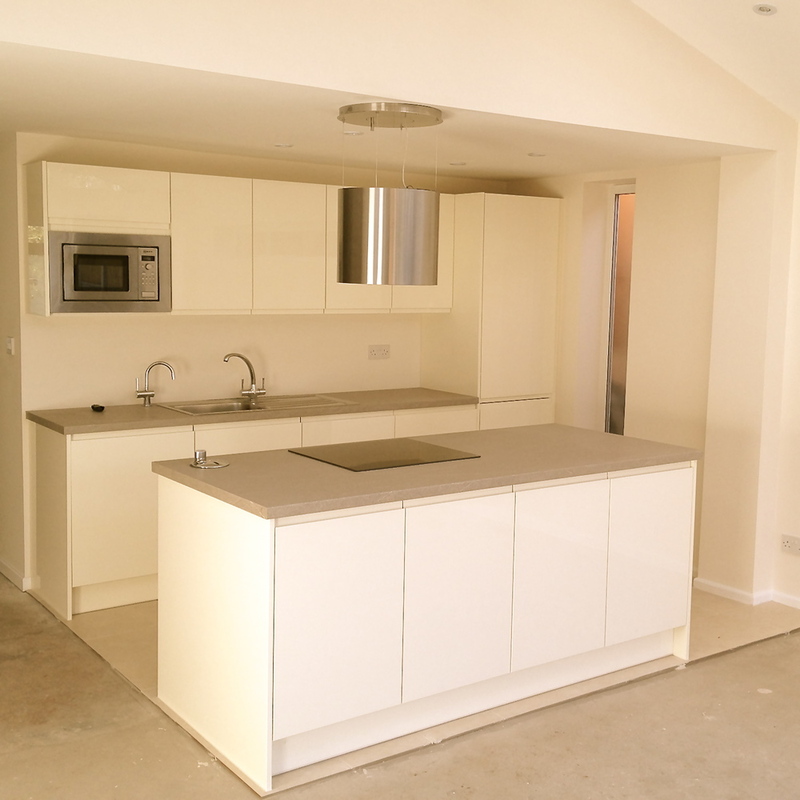 Our client downsized to a 1960s house on the outskirts of Harborne High street. Wishing to make changes for the long term future, he wanted the property to adapt to his requirements for day to day living. 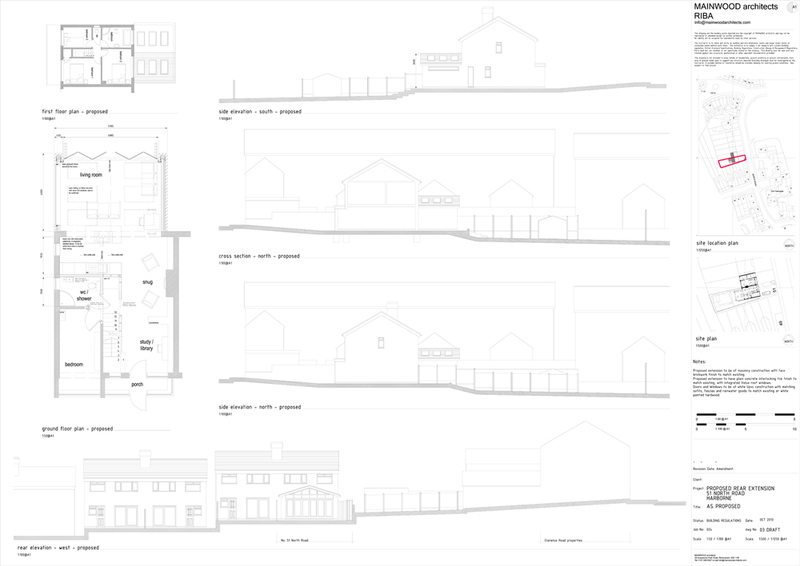 As part of the the new Permitted Development changes that came in to force May 2013, we completed a Larger Home Extension application for the proposals, to meet his needs. Changing the house to fit his lifestyle, we created an open plan living arrangement downstairs which would accommodate his requirements, including library, snug and kitchen/living accommodation. The layout maximises space and allows it to change as he uses this for different functions, from a large family gathering to the more intimate living arrangements one requires for day to day living. Initially we created several designs for him to decide which layout would be most suitable. Seen below. 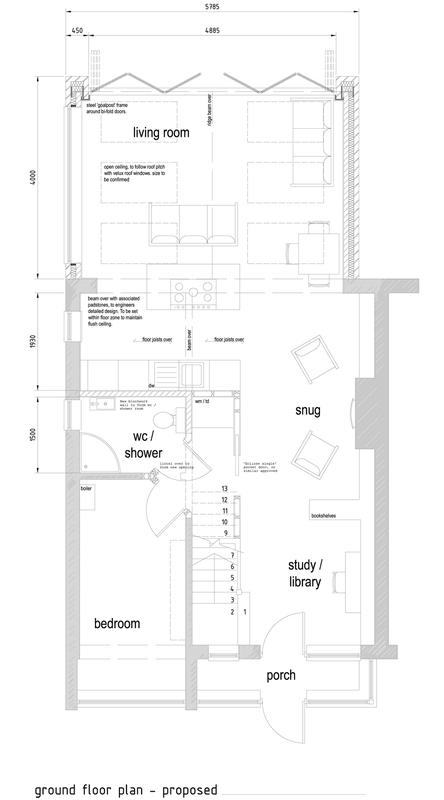 After the layout was agreed, the Larger Homes Extension application was soon approved, with the final internal layout as below. 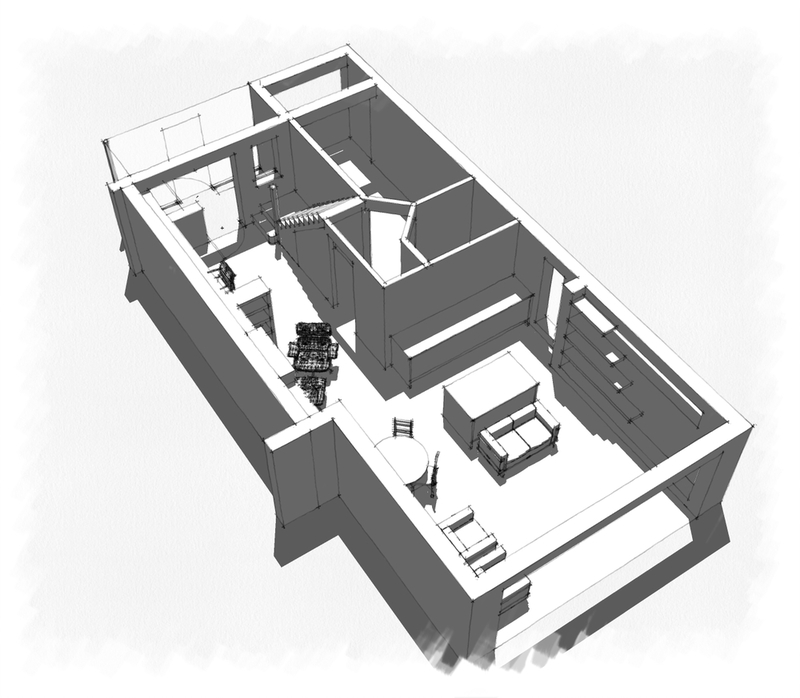 To the rear of the property, a large open plan layout incorporates Galley kitchen with island, Family / Living room and Snug, leading to the Study / Library to the front of the property. The open arrangement allows for the light to penetrate into the deep plan of the building, by use of roof lights in the dual pitched roof, large concertina glazed doors, angled high level glazing, roof-lights, and feature ribbon window to the Kitchen. The light penetration allows for the living space to have natural daylight throughout the day, and ensures that the snug does not suffer from being an internal space without immediate natural light. Following a building regulation application, building work has now commenced on site, which will finish spring 2014. 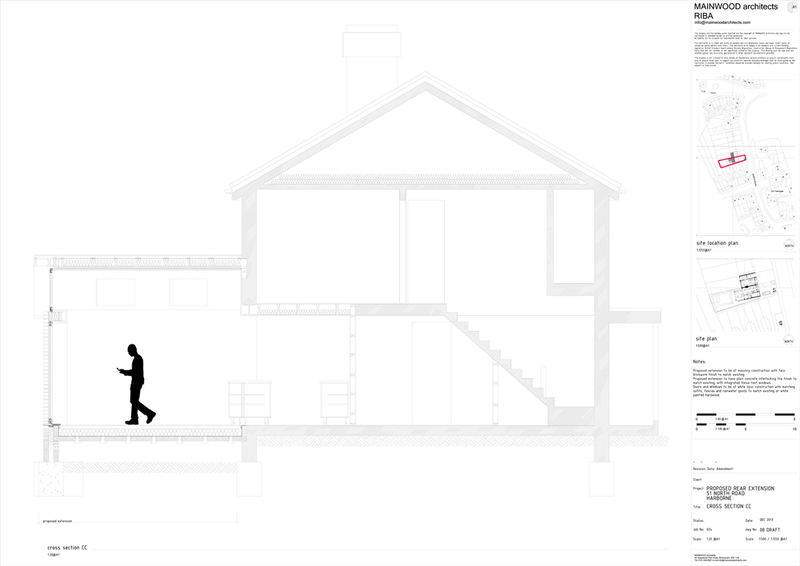 The Gallery above shows the as existing and as proposed drawings for the single storey rear extension along with a section of the proposed layout. The building work is projected to last 3 months for the proposed single storey extension and internal remodel, which is now almost complete. 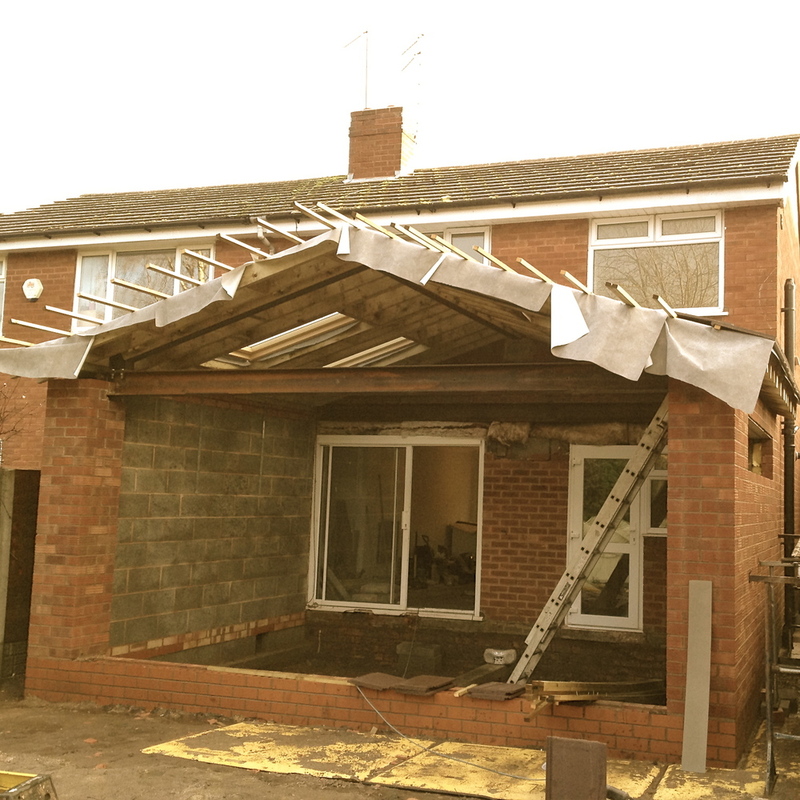 Below are pictures of the building work in progress. 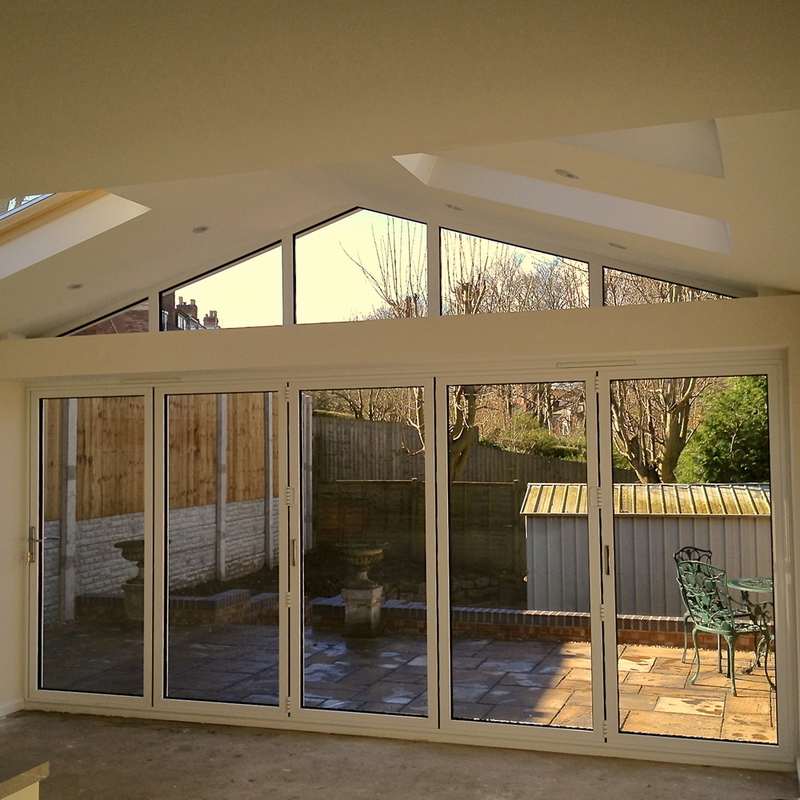 Single storey extension with apex roof, the finishes were completed whilst awaiting the delivery of the concertina doors, and apex glazing. Posted on December 14, 2013 by Ben Mainwood.